Eighty percent of Americans experience one form of back pain or another during the course of their lives. More men over the age of 45 are disabled by back pain than any other condition and it is the third most common reason for surgeries. Often these surgeries aren't even necessary to begin with. People complaining of back pain cannot be easily diagnosed because most doctors don't have the training to figure out the specific cause. This is because the spine is such an incredibly complex structure of bones, muscles, nerves, joints, tendons, and ligaments. Injury or disease affecting any one or more of these structures can often trigger an episode of pain. Lower back pain is often caused by a muscle imbalance. The erector spinae, or large paired muscles in the lower back that help keep your spine erect, can become too tight and spasm. Commonly these muscles are hypertonic (too tight) due to weakness in the abdominal muscles. This lower muscle imbalance causes the low back to become overly lordotic (curved) and it can allow the joints in the area to jam and become inflammed. This is commonly referred to as "facet syndrome." Over time this excessive wear can cause degnerative changes and result in pain in the low back. In more serious cases, low back pain may be caused by degenerative disc disease, or a disc herniation. A degenerative disc condition can sometimes cause a chain reaction of other events in your spine. When a disc is not in its proper place, or is malformed from disease or some other condition, it can allow additional undue pressure on other healthy structures, such as neighboring discs, nerves, muscles, joints, ligaments, and tendons. This can then lead to tingling or numbness in the lower extremity or gluteal region. Because the thoracic spine is the sturdiest part of the spine, it is less prone to injury. That said, upper/mid back pain, while less common than lower back pain, is often caused by irritation of the muscles or a problem with a joint. and is highly related to posture. Usually there is an imbalance in the muscles that stablize the shoulder joint and scapula. When this occurs some muscles become too tight, which results in pain and can actually pull on the ribs unevenly which can cause them to move from their normal position. Symptoms may be pain with certain phases of breathing or with certain motions specifically rotation or extension. People's posture plays a big role in pain in this region of the spine. 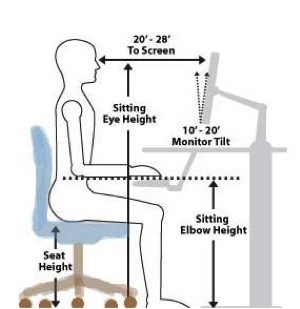 It is common for a person experiencing symptoms to have a "hunched over" posture and work at a computer or in office setting. Improper posture can start as a result of injuries like sprains and strains of the neck, imbalance of neck muscles, poor sleeping positions and abnormal breathing patterns. 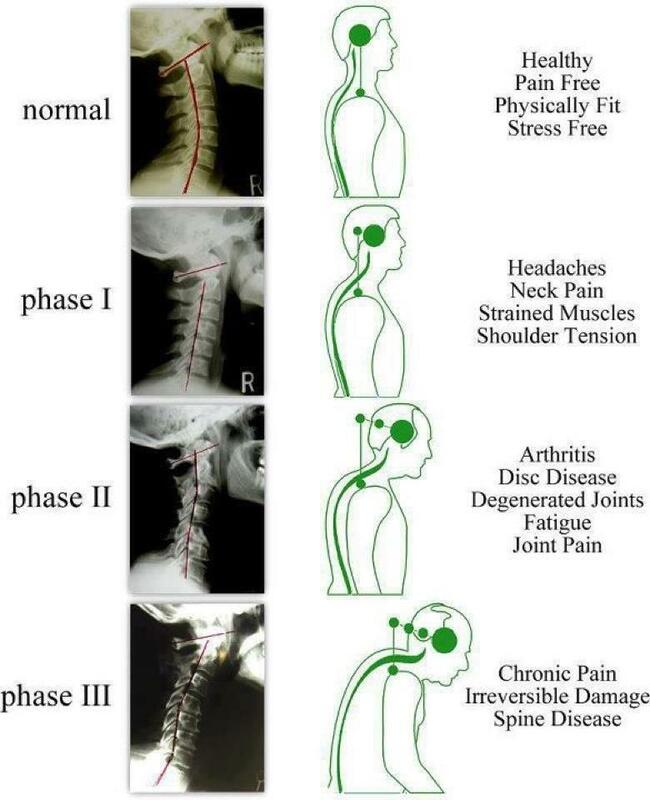 The extra pressure on the neck from altered posture flattens the normal curve of the cervical spine resulting in abnormal strain of muscles, ligaments, bones and joints of the neck. In the Spine Journal (1986;6:591-694) studies showed that this strain can cause the joints to deteriorate faster than normal resulting in degenerative joint disease or neck arthritis. It is important to catch this process early to prevent serious, sometimes irreversible, problems from occuring. To prevent these degenerative changes from occuring there are some simple things your can do. First sitting in your chair the right way as displayed in the above image is very helpful. 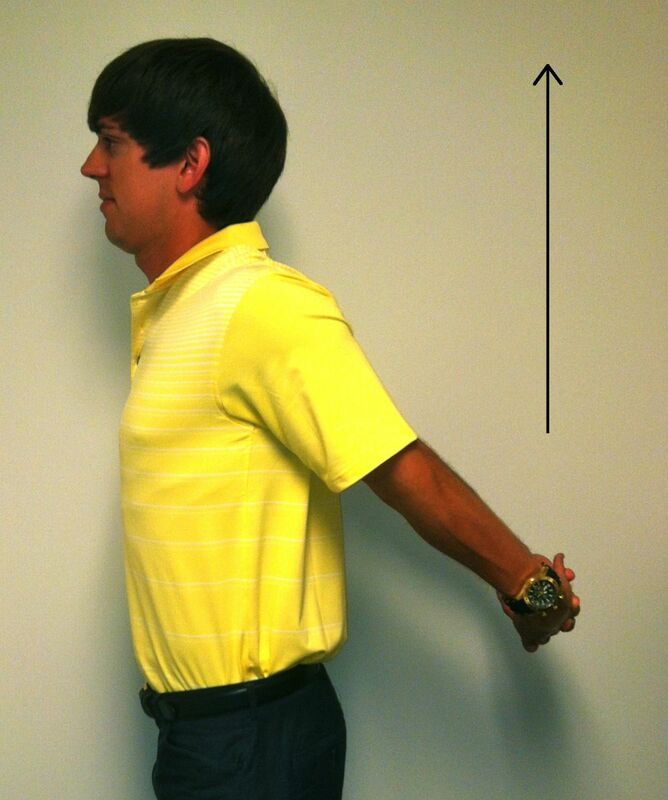 This puts your body in the best biomechanical position and can help take excess strain off the neck and mid back. If you spend a lot of time seated during the day it is important to seek out an office chair that is ergonomically correct and supportive of your body. Having one makes it that much easier to maintain good posture. Second it is important to get up and stretch your back periodically throughout the day in order to prevent this deformation from occuring. A simple stretch is to grasp your hands together behind your back and slowly raise them up to your tolerance of stretch and then hold them there for 10-15 seconds. Repeat this 3 to 5 times in a row and do it every 30 to 45 minutes. After an injury it is common to want to rest the area to relieve pain. However, rest for a sore back should be kept to no more than 1 - 2 weeks and that is only for serious injury or disc herniation cases. Otherwise, only 3 - 7 days is all you need, usually just waiting until you are able to move the area with no resistance without a high of pain. When you injury yourself your body will repair the tissue and it does so in the orientation of the pull and stretch the tissue is getting on a normal basis. So when you use your muscles and stretch the body as you would in normal activities of life, you will repair your tissue in the proper direction. When tissue is repaired in this way it helps the muscle regain its proper function and strength. When you rest for too long the body still repairs but there is no guidance as to how to lay down the new muscle fibers so it is a mess and in many different directions. This is commonly refered to as scar tissue which can sometimes be felt as a "lump" under the skin or in a muscle that has had an injur. This type of repair can hinder muscle function and not allow you to fully recover your previous strength and motion. Also it is important to keep motion in the area after inflamation has subsided because this motion stimulates mechanoreceptors which can block pain signals to the brain from the area. This is why for example if you bump your knee or hit your elbow on something you instinctively rub the area. That rubbing activates certain receptors and blocks the pain signal. Never push yourself or go against what your doctor recommends for you when it comes to rest and treatment. There are different conditions and situations that require longer and shorter amounts of rest and motion. Always consult with your doctor before beginning a new therapy or starting to do motion activities and stretching. Please refer to the other reference pages about Back Injuries, Ice Therapy, and Heat Therapy to learn more about your condition and what you can do to help your pain. Also if you have any questions please feel free to Contact Us at anytime we would be happy to assist you.